Green Living Technologies: Safety Aspects in the Standards analyzes codes, standards and official documents from countries around the world, including: the United States and Canada in North America, Germany, France and Italy in Europe, and Australia, Singapore, Japan and Thailand in Asia. This essential resource for building design professionals covers a full range of living technologies, such as vegetative systems, green architecture/urban design, construction efficiency, facades, fire protection, sustainability aspects in buildings, landscape design, tall buildings and wind design. The book provides an invaluable tool on international codes and standards and how to incorporate them into projects. Elena Giacomello, architect, PhD in Building technology. She is adjunct professor and research fellow at Iuav University of Venice. For the past 10 years she has been conducting research on the topics of green roofs, green walls and façades, vegetative technologies, and quality of urban living. During her PhD training in Germany she conducted laboratory tests on the water performance of green roofs through a rain chamber simulator, analysing the benefits for cities deriving from the application of green surfaces in terms of hydric detention and detention. In 2013 she won a research grant from the CTBUH-Council on Tall Buildings and Urban Habitat to lead monitoring research of the Bosco Verticale façades in Milan. She participated at the working table of the review of the Italian standard for green roofs UNI 11235: Instructions for the design, execution, testing and maintenance of green roofs, 2015. In 2016-17 she conducted research – as member of the CTBUH Research Office – through the international standards and official documents inherent green roofs/façades/walls to highlight gaps in the topics of safety. 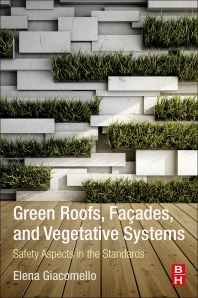 The results are published in the book: “Safety Standards for Green Roofs, Green Façades/Walls, and Vegetative Systems: What’s Missing”.